Free MamyPoko Air Fit NB / M Size Diaper Packs! at Baby Land from 1-3 March 2019 @ Singapore Expo Hall 5! Head down to the Baby Land Fair together with this Confirmation Email and 2019 Gynae Appointment Card / Baby Birth Cert. 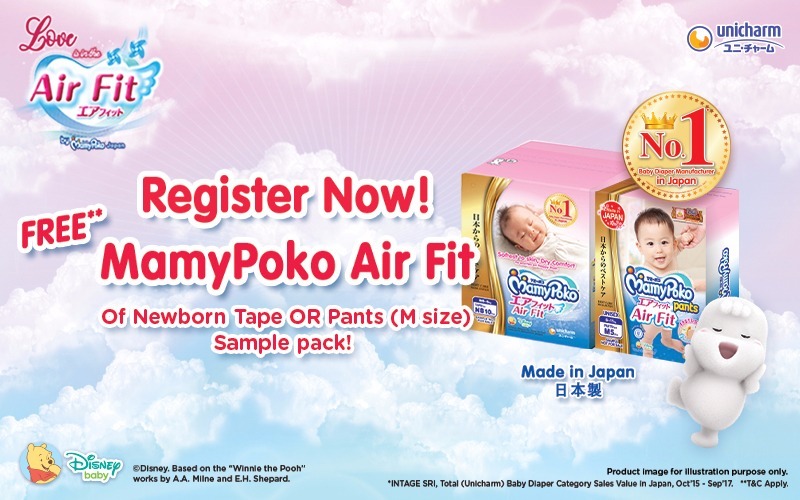 Present your Confirmation Email + 2019 Gynae card / Baby Birth Cert at the MamyPoko AirFit Collection Booth at Singapore Expo Hall 5 to redeem your free diaper pack. I understand the steps for participation and agree to the terms and conditions set out in this page for the MamyPoko Air Fit Pack Giveaway. I consent to the processing of my personal data by Mummys Market for marketing and/or research purposes, and agree to be contacted for any products and/or services updates, news, promotions, information via calls, SMS and/or emails. Limited to FIRST 2500 Expectant Mothers / 1000 Toddler Mothers with Babies age 4-12months old to be at Baby Land Fair (1-3 March 2019). Only Expectant Mothers/Mums are allowed to redeem the Mamypoko Pack. Family members, Friends & Relatives cannot collect on behalf. MamyPoko Diaper Confirmation Email with Unique QR Code and Gynae Appointment Card with an appointment date / Baby Birth Cert MUST be presented for collection.